Density and affordability: To become a truly sustainable city Seattle needs more of both, but is that best of both worlds possible? One camp argues that if you want to make housing more affordable, the best thing you can do is build as much housing as possible so that prices will fall due to supply and demand. All other things being equal, this is no doubt true. However in practice, new high-density housing tends to be relatively expensive, and in some cases may cause the displacement of existing low-income housing. And thus the opposing camp argues that dense redevelopment is an affordability killer. But they ought not to blame density itself. Inexpensive density has existed in cities throughout history, and is arguably the most prevalent form of housing on the planet today. Of course some of that is unacceptably subpar—a.k.a. slums—but the point is nothing about density precludes affordability. And in fact, dense housing is inherently cheaper because it requires less construction, less infrastructure, less operational energy, and less land per occupant. Nevertheless, in growing, economically vibrant cities like Seattle, new market-rate housing—dense or not!—is typically not affordable to a large portion of average households. This has two root causes: high demand, and high cost of production. Again, density is not the culprit. Demand is why the most successful cities have always been the most expensive cities. People recognize a city’s value, and they are willing to pay a premium to be there. There’s nothing to be done about it, aside from intentionally destroying a city’s economy and livability. Densification is the result of demand and rising real estate prices, not the cause. Regarding housing production costs, over the past several decades the cost of labor and materials to produce housing has risen faster than the average incomes of most of the U.S. population. That combined with the high price of land in desirable cities adds up to a cost that can put new housing out of reach for perhaps the lower third or more of households. Clearly, affordable housing is a vexing problem, but halting redevelopment—i.e. limiting density—is not the solution. While that approach could potentially save a relatively small amount of existing low-income housing in isolated cases, it would also lead to unmet consumer demand that would drive up prices and exacerbate the affordability problem across the spectrum. Furthermore, density is the key to the efficient operation of frequent transit service, which can enable lower-income households to significantly reduce their living expenses by not owning a car. And it is also important to recognize that today’s new multifamily housing will age—much of it not well—and is destined to become the affordable housing of future generations. Nor should we expect private developers or landowners to take full responsibility for a burden that should be borne by society as a whole. For relatively high-value projects (which are almost always high density, by the way), it is reasonable to encumber development with requirements to provide affordable housing in exchange for allowing increased development capacity. But for more modest projects, that approach can have the unintended consequence of reducing the potential amount of housing produced, which is a self-defeating outcome. Regulations should be ground-truthed in the reality that dense redevelopment is good thing in itself—the building is the benefit. In the end, the only viable solution is market intervention, that is, government subsidy. Most industrialized nations provide valuable subsidies on the consumer side through a range of major programs (health care, education, etc.) that redistribute wealth, and this would be the single most effective strategy for addressing the affordable-housing crisis in the U.S. Alas, ours is a culture in which socialism is a dirty word. So for now that leaves the supply side of subsidy, which is currently delivered through a variety of programs at the local, state, and national levels. These programs are vital to non-profit affordable-housing developers, and in particular for projects that address the very low-income range, which is by far the biggest challenge. Private developer incentives can also be an important part of the mix for the “workforce housing” sector. As the reality on the ground makes clear, however, these programs are not enough. 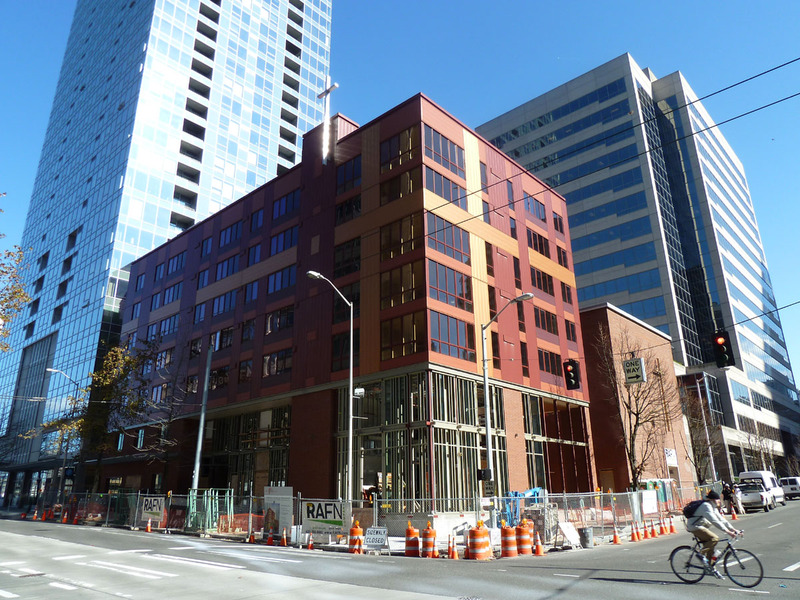 We need to beef up Seattle’s housing levy and the State’s Housing Trust Fund, for example. We also need to pursue innovative new strategies like the land acquisition fund currently being developed by the City of Seattle to secure land for affordable housing in strategic locations with good transit access. Or how about a federal program that picks up where HOPE VI left off but focuses on equitable redevelopment in high-capacity transit station areas? And one more thing: If we want more affordable housing in Seattle, we need to learn to love us some density. Dan, you had me frustrated at the beginning, but, happy by the end of this piece. Thanks for your vocal support of the Levy and the HTF – both absolutely critical to building long-term affordable housing in expensive markets like Seattle. As you probably know, HTF is on life support right now, so folks, please call your legislator and urge them to fund the State HTF. You are right in that the root cause of lack of affordable housing is plain old free market capitalism. When costs to build are so high, and profits need to be made for investors (who supply the cash to build) rents go up, simple as that (when there is demand, of course). And lack of affordable housing is a clear market failure. This is why I am always arguing against the crazy logic that density creates long-term affordability – logic that often plays out in posts here. It is absolutely not true in practice and I think we are about to head into a cycle that will demonstrate this with all the new units coming online over the next two years. I believe there will be a brief period of oversupply where concessions and lower rents will prevail (rents, btw, that will still be well above 60% of area median income) and then the market will correct (fewer people will build) and rents will spike back up again. New multi-fam market construction moves in these financing cycles and there is nothing about them that is long-term affordable. And over time, average rents in entire markets, like Capitol Hill, steadily climb with the new expensive products that are delivered. We also should be asking ourselves what would have happened to prices in Seattle’s high-demand neighborhoods if we had not allowed as much of that new density to be built? I think it’s safe to assume that rents would be even higher, because there would be less supply. Yes, the typical pattern in economically healthy cities is prices go up as density goes up, but that’s because even with all the new density being added, demand still outpaces supply. That said, maybe I wasn’t clear enough in the post that we shouldn’t let the density/supply argument obscure the fact that increasing supply alone won’t deliver affordable housing to a large chunk of households, and that means we need much more support for housing subsidies of all kinds. Dan, this is a very good question and one worth more exploration. Rents might be higher without the additional density, or that density might have gone to the burbs, like Redmond or North Bend, in the form or sprawl or something else outside of the City. Since our UGA is artificially drawn and legislatively enforced, what we have essentially done is create markets where they might not be otherwise. I am sure Pike/Pine would still be hot, but not sure all the institutional investment we are seeing would be deployed here in the same amount or frequency. I think what is consistently missed here is the idea that real estate finance and development is a segmented and targeted industry – supply never happens based on overall demand, for example. It is always based on a certain kind of demand. And that this demand can be pushed and played with between neighborhoods. To me, this is at the core of gentrification, and why people struggle with density so much, because there is a very real “pushing out” of affordable housing when new market multi-family gets built. People who used to live in Capitol Hill move to the Rainier Valley. Folks that lived in Ballard move to Shoreline. Because the new stuff is built to the demand in the luxury or high-rent segment of the market, not the affordable. Which brings us back to your statement that the only way to effectively reach that market in the numbers that we need to is through subsidy. Plain and simple. I agree with kgdlg. I was fired up at first but by the end I came to appreciate the balanced approach Dan took in writing this piece. 1. New projects with high rents often encourage owners of neighborhing older housing stock to rehabilitate in hopes of increasing their own revenue. A proven market and all that. 2. With density comes other amenities (which is great!) like parks, libraries, rapid transit, etc… This increases the demand for housing in the whole sub-market and thus rents. Just some nuance to add to the conversation. In the end, subsidy is the most effective tool but value capture (incentive or inclusionary zoning) should also be in the tool box when appropriate/feasible. You touched on it briefly, but deregulation should be part of the equation. We don’t want to allow folks to build slums, but Seattle has overzealous rules on building, which pushes the cost of housing up. First to go should be the parking minimum requirements. This is, of course, in the news lately. But just doing that should lower the prices a bit. I’m not sure what other regulations exist with regards to housing, but I’m sure there are creative ways of greatly increasing the number of units. I fully agree with RossB in that parking minimums should be eliminated. However, in the near term, this won’t result in less parking being built, which is because of banks/investors requiring parking stalls, not owners. And moreover, when private developers are successful in building less parking, I don’t think it will result in unit prices going down all that much – especially when the Link is fully built to the North End. I think that difference will simply be captured by investor profit in really well located hot markets like Cap Hill. Affordable developers are already building less parking, especially downtown and close-in. I think before a discussion on Density And Affordability can really be clear – you need to bring up one item relatively unique to development in the Pacific Northwest – in the US, OR and WA are the only two states other than Tennessee that require cities to establish urban growth boundaries (UGB). A serious exploration of density & affordability should consider this variable in formulating any sort of conclusion on said matter. James, I agree and you would be surprised how little research has been on on the relationship between the UGB and affordability. In addition to this, we already live in a land constrained environment (the peninsula that is Seattle) so I think we are doubly impacted by lack of land, which eventually drives up cost. Land here is very expensive due to the fact that much of what is left for development is strangely shaped, dirty or needed a lot of pre-entitlement prep. This is what underpins the entire concept of dense urban town centers. If we didn’t have this regional mandate, many of these developers would opt instead for building cheaper sprawl developments far from Seattle. But what I think we have discovered is that there is a very robust higher end market for density in Seattle, particularly in certain amenity rich neighborhoods (Ballard, Cap Hill, Northgate) and this has not deterred developers, because they know they can get very high rents in these areas, so the expensive land development cost is worth it. One also has to remember that most private developers of rental multi-fam are not invested in a long-term hold of a property. They buy it, develop it, rent it up, stabilize it and then a few years later sell it for an enormous profit over what it cost to build it. This means that they aren’t interested in long-term affordability, superior building techniques (that are very expensive or have a long pay back) and neighborhood desires. They are interested in one thing, profit and whatever it takes to get it – usually a fully leased building. Diversity, far more than density, is the lacking element in urban/suburban development. Downtown Seattle transit, walking and bicycling are dysfunctional. Hazardous street traffic will worsen with higher density. Travel downtown is not a diverse choice. Economic diversity is a mix of uses that merely includes housing, high-density or not. Productive occupations downtown are mostly filled by suburbanites who have little choice to reach downtown but by driving. To construct an economically ideal diversity downtown, the more glaring lack of diversity in the suburbs must also be addressed. When fewer suburbanites chauffeur automobiles to parking spots downtown, then will market forces be less able to dictate cost of living downtown. Seattlers are too delusionally sure of themselves and their opinions to ever accept being wrong, dead wrong.